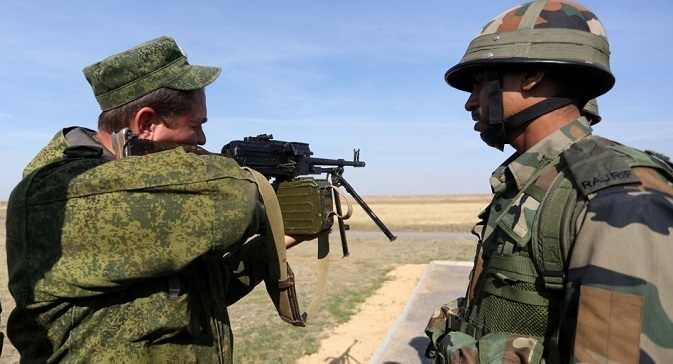 Russian Armed Forces plan to conduct five joint military drills with the armies of India, Mongolia, China, Belarus and the Collective Security Treaty Organization (CSTO) countries in the second half of 2015. Russian land forces will join troops from China, India, Mongolia and Belarus in a series of joint military training exercises during the second half of this year, President Vladimir Putin's office said Wednesday. Moscow has become especially keen to build closer economic and other ties with the Asian giants China and India since the United States and European Union imposed sanctions on Russia last year over its annexation of Ukraine's Crimean region. Russia also plans a number of other training exercises for its armed forces this year, Wednesday's statement said, part of efforts to counter what Moscow portrays as an aggressive, anti-Russian stance by NATO. Chinese President Xi Jinping and India's President Pranab Mukherjee joined Putin in Moscow last Saturday for a military parade marking the 70th anniversary of the allied victory over Nazi Germany in World War II in Europe. Western leaders skipped the event in protest over Russian policy in Ukraine. Last week, Xi and Putin signed a $25 billion deal to boost Chinese lending to Russian firms and a host of other economic accords. China has also invited Russian troops to march in a parade in Beijing in September. At Wednesday's meeting with military chiefs, Putin called for the swift completion of trials of new technology intended for Russia's land forces to allow for its deployment. Putin also said work was continuing on planned rocket systems "with heightened capabilities" that would be able to circumvent anti-missile systems. Putin held talks in Sochi on Tuesday with U.S. Secretary of State John Kerry, on his first trip to Russia since the start of the Ukraine crisis. But they made no concrete progress on ending it. Russia denies Western and Ukrainian accusations that it is arming pro-Russian separatists battling the Kiev government's forces in eastern Ukraine, in a conflict that has killed more than 6,100 people.